Hi Everyone! I have a fun post planned for today - a guide and recap for my three days on the island of Mallorca in Spain! (I'll have my recaps for Denmark and Sweden coming soon!) It was an amazing trip and the island was breathtaking. We spent one day in the city of Palma, one day in Soller and one day in Sant Elm/Port d'Andratx, and I'll highlight each area in the sections below. I want to start off with a bit of background of the island. I didn't know much about it before visiting, and it's such an interesting place! I hope you enjoy! - The island is called Mallorca (or Majorca) and the capital is Palma. It's a bit confusing, but the island is in the Mediterranean Sea and part of the Balearic Island (which also includes Menorca, Ibiza and Formentera.) Mallorca is the largest of these islands. - There's a lot of German and British tourists on the island, so speaking English is no problem. The official language of the island is actually Catalan, but Spanish is just as widely spoken. Most of the signs and city names were Catalan. When we were greeted by a local, they would usually greet in Catalan and Spanish and continue in Spanish once we started speaking. We were also asked a few times if we were German or British, so I don't think a non-Spanish speaker would have any problems. I would recommend learning a few easy phrases in Spanish and you'll be fine! - Try the sobrassada, ensaimada and olives. These are all important Mallorcan dishes and are delicious! Sobrassada is a spread made of a mix of pork, paprika, other spices and other meats. It's really mild and delicious on top of bread (especially a tostada con aceite y tomate!). 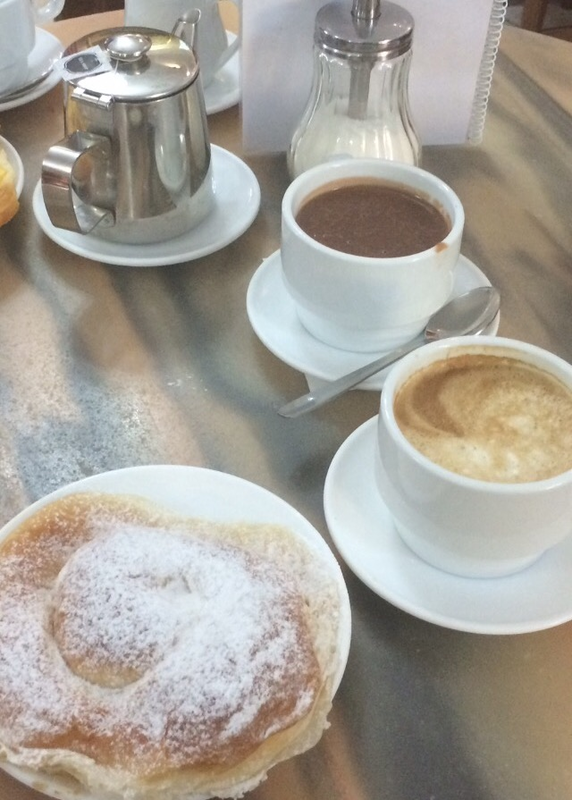 Ensaimadas are light, flaky pastries that are delicious to dip into hot chocolate! At most restaurants, we received a dish of olives with our drinks, and they were amazing. Watch out for pits though! - Public transportation was great. We took the buses and trains around the island and never had any problems. TIB will take you anywhere on the island. When you get on the bus, tell the driver where you're headed (fare is based on distance). EMT will take you around Palma and to the airport (linea 1), where there is a flat fee (it is 3 euro to get the the airport). - Tennis player Rafael Nadal lives on the island. I love tennis and was hoping to run into him, but no such luck! Palma: I had my first experience using Airbnb, and it was great! Our room was $35 a night and was a few blocks from the water. There is a bike and walking path right on the water, which I used for my runs. It was extremely safe and heavily used the entire time I was there. Soller: We stayed in Palma the entire trip, but during a hike to Port de Soller, we walked through the beautiful Ca N'ai hotel (before we got kicked out). It's pretty secluded and in a beautiful area of the island, and the grounds were gorgeous! Palma: As I mentioned above, the ensaimadas can not be missed! We got them at an adorable little bakery called Ca'n Joan De S'aigo. The pastries were unbelievable and the coffee was great as well. Our last day, we wandered around a pedestrian street near the Passeig del Born called Carrer dels Apuntadors, and there were tons of great restaurants. That area is a bit more touristy, so the prices are a bit higher. The atmosphere and vibe of the area makes up for it though! Check out Bar Abaco, which has an incredibly ornate, over-the-top interior and pricy cocktails. There's a cheaper bar down the street called Agua Bar, which is owned by a New Yorker and has great specials! We went during flip night and ended up getting 2 free drinks for guessing tails/heads on a coin flip. There's also ladies' night where ladies drink for free! Soller: In the main square of the town, right by the train station, there are lots of cute little cafes, where we stopped to get some drinks and tostadas. There are even more options in the Port area, which is more touristy and expensive. All the restaurants on the main street in the port have beautiful views of the water and most offer tapas menus and cheap sangria. There are also lots of gelato vendors, which I would recommend while walking along the beach! 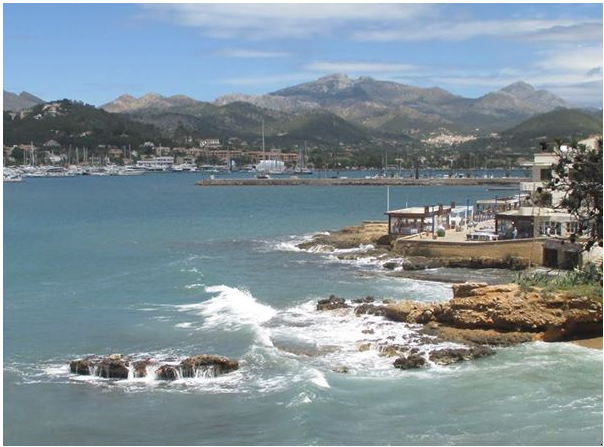 Port d'Andratx: This area is one of the most pricy that we visiting in Mallorca. It's primarily a yachting destination, so the target audience is in a higher tax bracket than me! There are lots of restaurants along the water and some cheaper ones a bit off the main road. We just stopped at a cafe for drinks and tapas. The main grocery chain in Mallorca seemed to be Eroski, which we found in each place we visited. The food was really cheap, so we bought groceries and had picnics as much as possible. They do charge for plastic bags, so bring some along! Palma: The city is full of beautiful buildings and streets to wander around. We spent our first day touring the city centre, and here are some highlights! Talk about a beautiful building! La Seu, or Mallorca Cathedral, is definitely a standout in the city. It was restored by Antoni Gaudi (who also designed La Sagrada Familia in Barcelona..also incredible) It's a huge building that sits right by the water and is surrounded by grassy lawns, where we picnicked. There were markets in the area as well if you're interested in checking out authentic Mallorcan souvenirs! There are a few shopping streets/pedestrian areas in Palma, but my favorite was Passeig des Born. The street is lined with trees that form a canopy over the sidewalk. In the center are lots of restaurants and cafes. This is really close to the Cathedral and other famous landmarks in Palma! Soller: Soller and Port de Soller were definitely the highlight of the trip for me. There is a wooden train that runs from Palma to Soller, and then we hiked to the port (there are signs along the way and it's very easy to follow!) The area was absolutely breathtaking! The train ride was absolutely beautiful! We road through the mountain and saw lots of fruit and nut trees. This is a longer (and more expensive) way to get to Soller, but I would recommend checking out Ferrocarril de Soller at least one way, and taking the bus back. #NoFilter necessary..the water was incredibly blue. This was taken on a road near the Lighthouse (you can't actually walk to the Lighthouse, but the views were worth the walk!) You can see the view of the port area below. Sant Elm/Port d'Andratx: Our final full day in Mallorca was spent in Sant Elm and Port d'Andratx. Our plan was to hike, but we couldn't find the correct path! Instead, we spent a few hours hiking up around Sant Elm, then busing back to the port. Both areas were so beautiful! Sant Elm is a tiny town with only a few restaurants and a small grocery store, while Port d'Andratx had tons of restaurants, shops and a big Eroski. We hiked for a while and ended up at the top of a mountain! This was a beautiful spot to stop and have a picnic while enjoying the incredible view of the water. The path we followed started at the end of Carrer Cala es Conills, and went straight up the mountain on a cairned path. Not a bad lunch view, huh? There is a small, uninhabited island close to Sant Elm (which you can reach by ferry) called Dragonera. There are supposedly hiking trails all over the island. Port d'Andratx had beautiful views of the mountains, as well as pretty sea-side cafes. We walked around the main roads and had some beautiful views! As you can tell, the water here is also crystal blue. Beautiful! Overall, Mallorca was one of the most beautiful places that I've ever visited. The people were friendly and I loved being immersed in the Spanish culture. I would highly recommend anyone visit if you get the chance! Linking up with Treat Yo'Self Thursday and Thinking Out Loud. Have you ever visited Spain? What did you think? Now that's just gorgeous! I've never visited Spain, but I'd really love to some day, and I'm definitely hoping to visit some of the places you went to because... yeah... WOW. You should definitely visit! This was my 4th city in Spain I visited and they're all incredible (and really affordable!) Glad you liked this and thanks for hosting! I've heard of how amazing Majorca is, and this just proves it. Good freaking goodness. Just. Wow. No words. :) :) :) That was me the entire time! Ugh, I want to be on vacation so badly now. Your trip sounds like it was so relaxing and the views are just gorgeous! It was great! Hope you can take one soon, or at least have a relaxing day at home! That all looks spectacular! No wonder a lot of people vacation there, and all the food looks wonderful. Spain is on my bucket list but I feel like I need a lot of time to see everything. I know what you mean! I wanted to stay longer, but I'd rather see more places than spend more time in one place, if that makes sense! What beautiful photos - looks amazing!!! The place you found through airbnb sounds fantastic! This trip sounds like the perfect combo of exploring locally and hiking. Everything looks beautiful! It was great! I want to talk more about it but didn't know the proper protocol for writing about those places on the Internet. I would recommend it though!